Tina Taylor‘s summer pics are back! I picked out some of the best ones of Lucy and scenery (since Matt already covered all of the produce bases with his last photo post). There is also one picture of the new chickens. Tina came on quite a busy day. 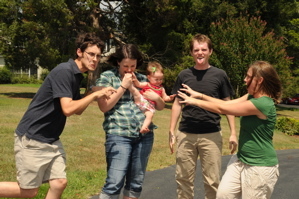 It was the same day as Lucy’s dedication at church, it was blazingly hot and Caleb’s family was in town visiting. Some of these things are reflected in the pictures (perhaps most notably, Lucy’s exhaustion). Check out the Summer 2010 album here.